Chicago, IL - One of the cultural highlights of this year was a program of Serbian poetry and music presented at the social hall of Holy Resurrection Serbian Orthodox Cathedral on Tuesday, December 14, 2010. A mixed audience of Serbs and Americans, moved by the beauty of the poems and songs, reacted enthusiastically to the event and to this experience of Serbian culture. The program, curated and presented by Vesna Neskow, consisted of Serbian poems, read in both Serbian and English, and Serbian songs that were selected by Elizabeth Neskow, who directed an octet of singers. The two readers, Vesna Neskow and Deacon Damjan S. Božić, thrilled the audience with their dramatic readings. Interpreting the ethos of the poems, the Deacon Damjan’s mellifluous voice conjured images both epic and lyrical. Ms. Neskow’s performance ranged from the intimate voice of the storyteller to the playful irony of the perceptive poet. The selection of poetry began with the oral tradition of epic folk poems and spanned 19th and 20th-century works. The poems, presented with an introduction about each poet and work, were: Stari Vujadin (Old Vujadin), an epic folk poem; Tri Hajduka (The Three Outlaws) by Jovan Jovanović Zmaj; Moja Poezija (My Poetry) by Jovan Dučić; Tražim pomilovanje … Za važne (I Seek Mercy … For Important People) by Desanka Maksimović; Život (Life) by Miloš Crnjanski; Kalenić (Kalenich) by Vasko Popa; Mala kutija (The Little Box) by Vasko Popa; That Little Something (Ta sitnica) by Charles Simic; Nije nikakva (She’s Nothing to Look At) by Radmila Lazić; and from Satirične pesme (Satiric Poems), Ženio se Majstor Peka (Master Peka’s Wives) by Jovan Jovanović Zmaj. For each poem, music complementing the spirit of the literary work was performed by an octet of singers culled from the Serbian Singing Society Branko Radičević. The songs were softly vocalized during the reading of the poems, creating a dramatic and emotional effect that stunned and delighted the audience. The octet also sang three selections: a secular song, a sacred piece, and a folk song. 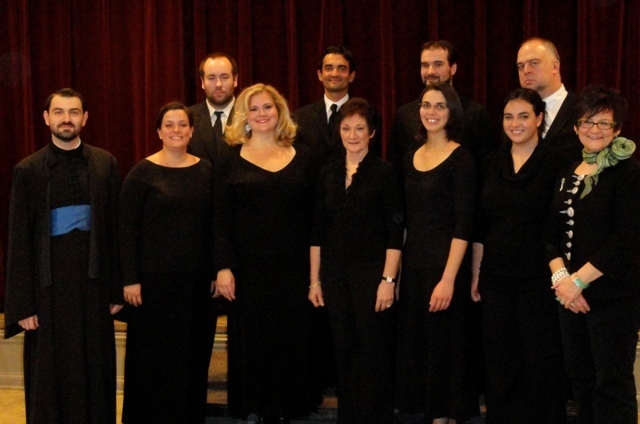 The singers included: Ana Budišin, Jelena Stojaković, Jelena Vranić, Lara Lappin, Alek Lappin, Ivan Budišin, Rev. Vasilije Vranić, and David Sekicky. The evening benefited the Chicago literary organization The Guild Complex as well as Holy Resurrection Cathedral.